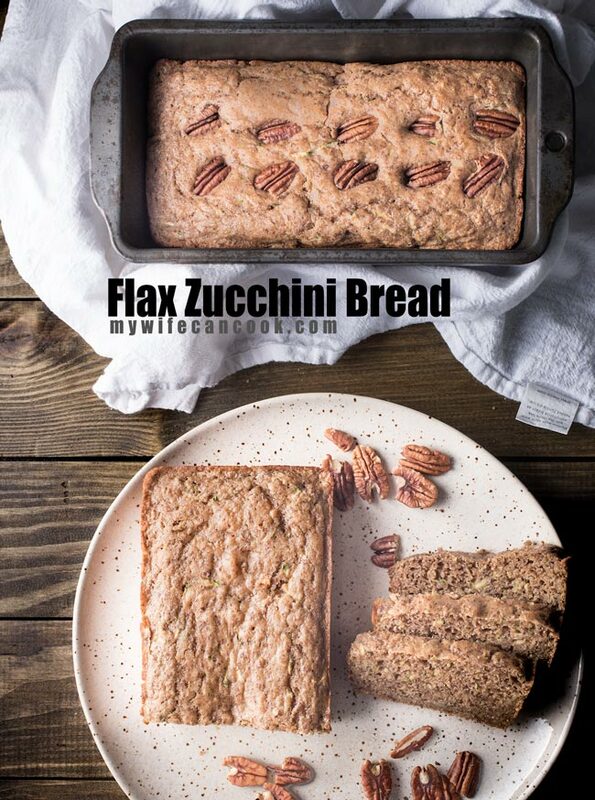 We have been eating this flax zucchini bread for years. 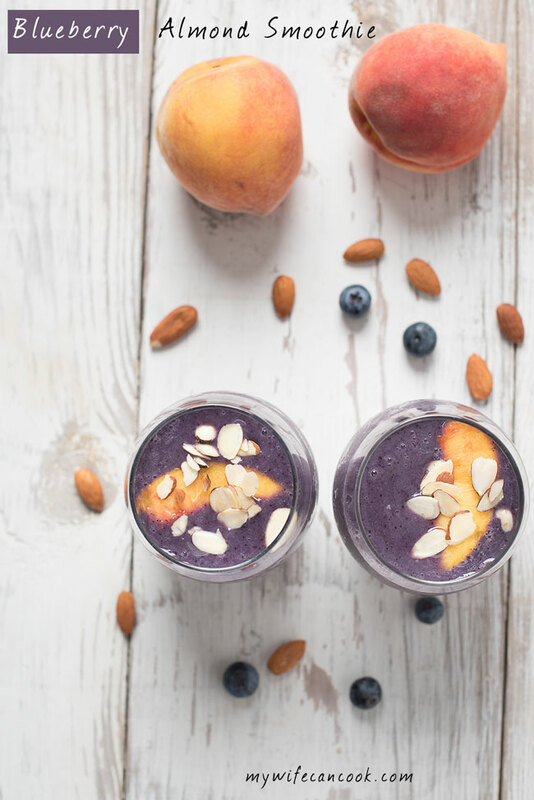 The original recipe came from Cooking Light, however, we have modified it over the years to have less sugar, no eggs, substituted spelt flour, and added buttermilk (I always had trouble with the liquid to dry ratio in the original recipe). While we did reduce the amount of sugar in the recipe, because we eat it with breakfast occasionally, I wouldn’t label it low sugar. We have made sugar free banana bread by subbing in boiled cider from King Arthur flour if you are looking for an even lower sugar bread. I think a lot of shredded zucchini recipes call for squeezing all the liquid out of the zucchini. I skip this step things have always ended up fine. I think this also keeps the bread moist. Do you need to peel the Zucchini? Peeling the zucchini is unnecessary. It all blends together when baked. I usually make this bread with medium sized zucchini. I find smaller sized zucchini are really good sauteed. If you have a mammoth baseball bat sized zucchini, I think it would work okay, too. If you don’t have spelt flour, a mix of wheat and white flour works just as well. I personally like the flavor of the spelt flour and have some in the pantry after using in our pumpkin spelt waffles. I have not tried gluten free flour, but would guess that any gluten free flour substitutions that normally work for baking would work here. 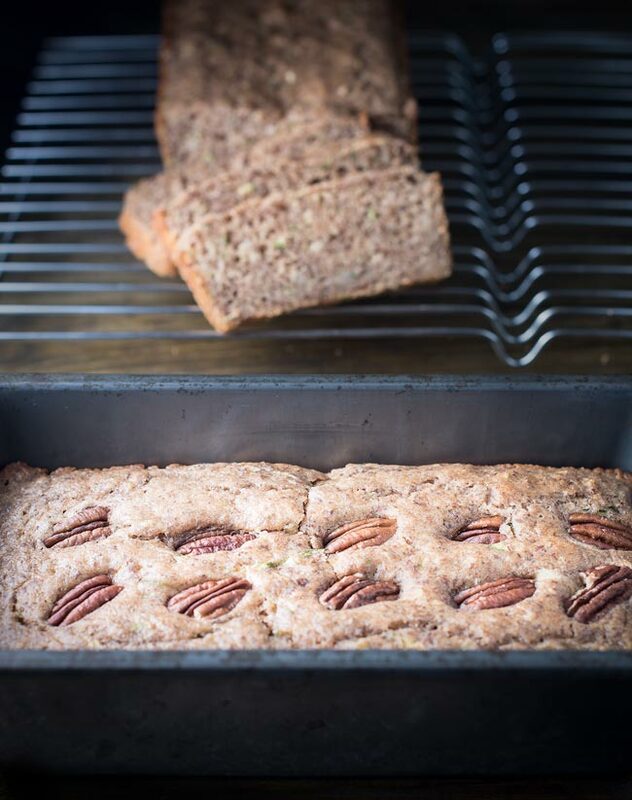 I used ground flax or flaxmeal in this bread for two main reasons–because we like the flavor and added health benefits of flax. Also, when adding flax to baked goods, you can frequently reduce or skip using eggs. We used this same method to reduce or eliminate eggs in our homemade flax cornbread and vegan pumpkin donuts. 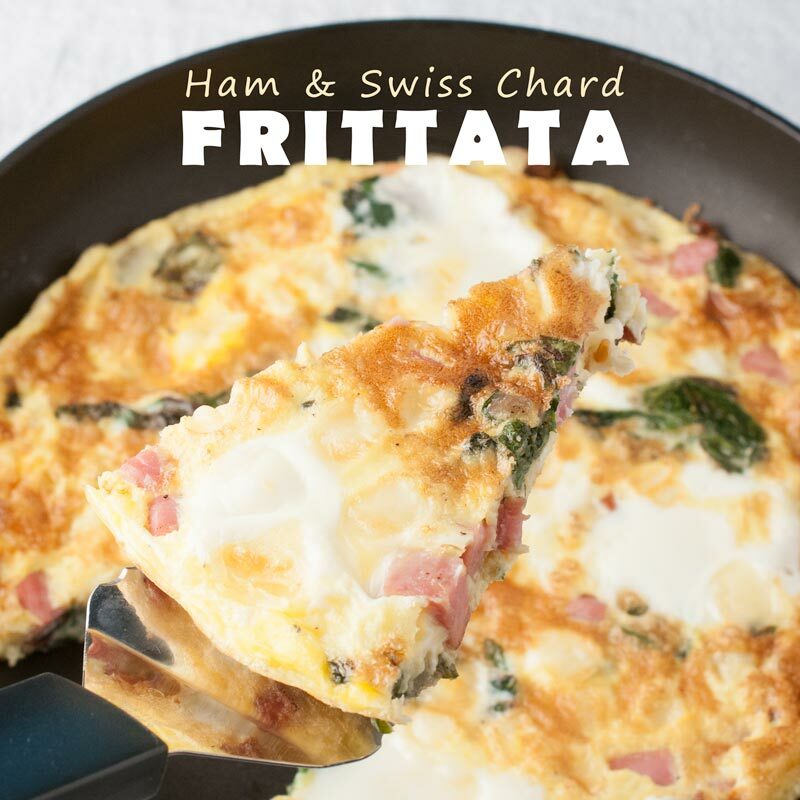 We eat quite a few eggs, but honestly I prefer them in a frittata or fried for breakfast. Plus, we have friends/family with egg allergies, and this bread still tastes delicious without eggs, so why have something we all can enjoy? The addition of pecans is optional, however, we really like it. 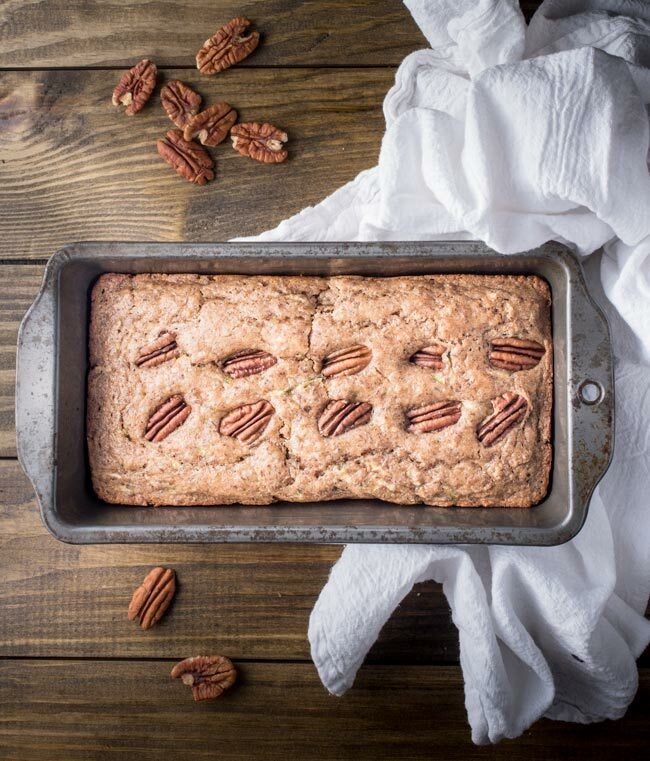 If you really want to add something to the recipe, toast the pecans first. I generally let the bread cool in the pans for about 5-10 minutes, then remove and let cool on a wire rack until cool. Make sure it has cooled completely, then store in a ziploc bag. We tend to eat this in a day or two, but if it’s hot out or you want to last longer than a day or two, store in the fridge. In this recipe, I divided the batter into two medium bread loaf pans. Feel free to use one large pan, but increase the cooking time slightly. 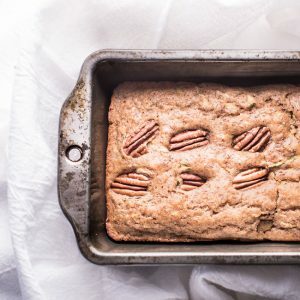 According to these projections from Still Tasty, zucchini bread only last a few days in your pantry, but can last several months if you freeze it. So don’t waste the leftovers! 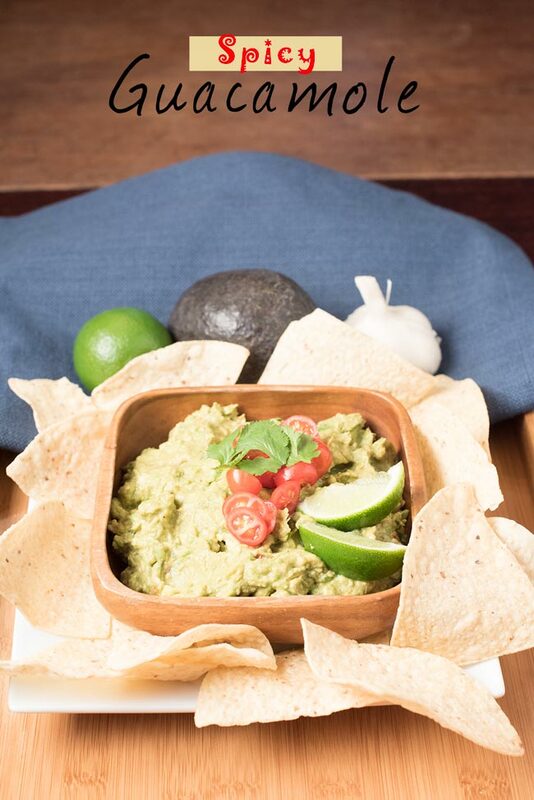 Better yet, make extra with the plan of freezing some for later. The Kitchn gives some great tips for the best ways to freeze and thaw bread. 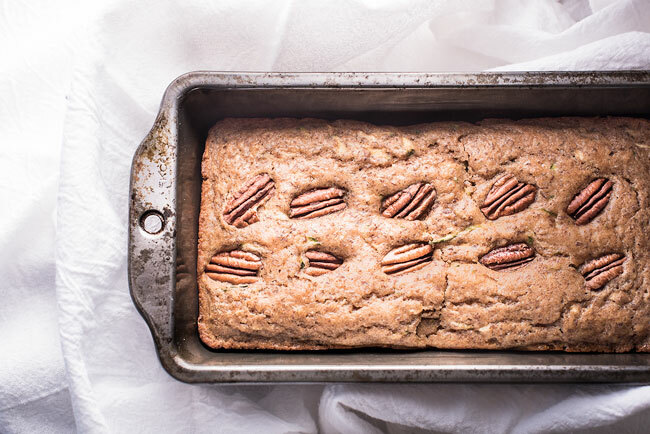 Zucchini bread made with vanilla yogurt, flax, spelt flour, and egg free. Grease two medium bread pans. Combine and stir dry ingredients: flour, sugars, flax, baking powder, cinnamon, salt, and baking soda. Combine and mix zucchini, yogurt, oil, buttermilk, and vanilla. Add wet ingredients and pecans to dry ingredients and stir until combined. Pour evenly into 2 loaf pans. Cool for 10 minutes in pan, invert and let cool completely on a wire rack.